How to use images in a Klip – How can we help you today? Overview Use web accessible images, stock images, and more in your Klips. Importing an XML or JSON file and selecting an image URL from the data source. Copying an image URL and pasting it into the Klip Editor. Uploading an image from your computer and using it in the Pictograph component. Using one of our ten stock funnel image URLs in the Table component. Many XML or JSON data sources, such as Twitter and Facebook, provide you with image URLs. Drag an Image component into the Klip workspace. Navigate to the Data panel. Select an image URL in the data source. Select the Properties panel to adjust image appearance. You can use publicly accessible image URLs in a Klip. On the web, find the image URL and press CTRL+C. In the Klip Editor, select the Properties panel. At Format as, select Image URL. Select the Insert Literal String or Number button. Press CTRL+V to paste the URL in the Insert Text or Number box. To use multiple images in a Klip, use the ARRAY function. For more information, see ARRAY function. For an example of the ARRAY function being used with images, see How to use funnels. 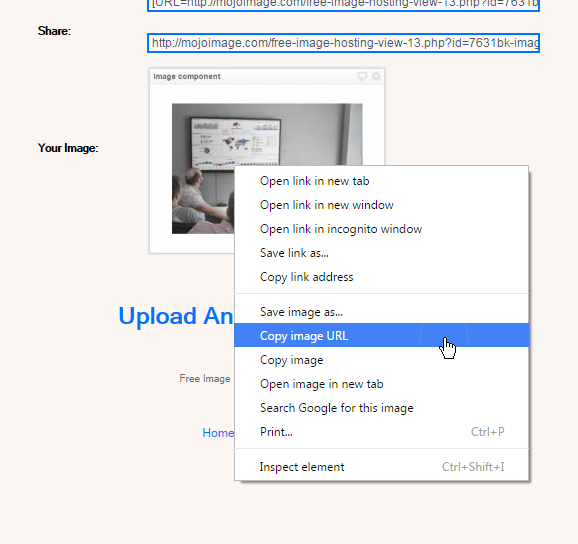 For example, on http://mojoimage.com/ you can upload an image from your computer. After your image is uploaded, right click on the uploaded image, and select Copy Image URL. Follow the steps in Copying a public image URL to add the image to your Klip. The Pictograph component allows you to upload a custom image from your computer. In the Component Tree, select the Pictograph sub-component Image Set. Click the Select Image button. Your image is added to the Klip. Important: Klipfolio can process files up to 2 MB in size. Klipfolio offers ten stock funnel images you can use in the Table component. For more information, see How to use funnels.